Bookmap, an innovative visualization and trading platform for US Equities, Futures and digital currencies and Devexperts, developers of retail and institutional trading platforms and providers of cloud based financial data infrastructure are proud to announce the release of Bookmap version 7. Munich, Germany, January 31, 2018 – Bookmap and Devexperts are proud to announce the release of Bookmap version 7, a financial visualization and trading platform. Bookmap’s data visualization offers complete depth of market transparency. The platform’s heatmap allows traders to monitor the auction, observe and interpret the evolution of the order book, the market microstructure and the volume traded with amazing clarity. With the power to execute trades directly from the chart, Bookmap is the first independent software vendor (ISV) enabling to trade Futures, Stocks and Digital currencies simultaneously. In addition, Bookmap also includes advanced order flow analytics, indicators and automated strategies. 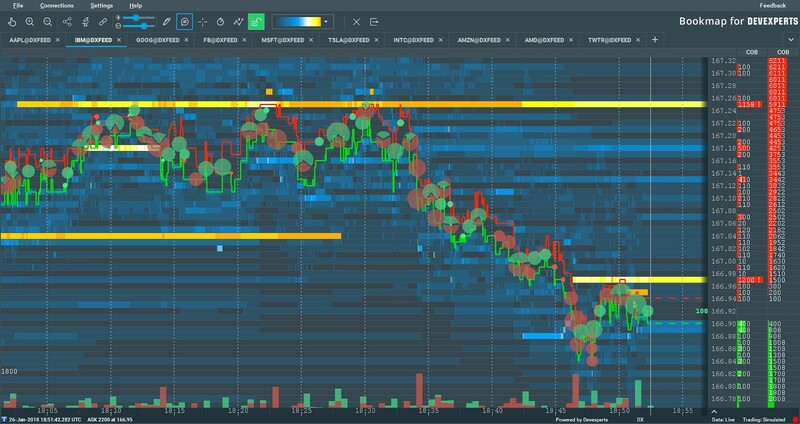 A unique approach to visualizing the dynamic in the order book on the fly, further enhanced with a new colored heatmap supporting a wider color range. Trade stocks with fast action directly from the chart. It is now possible to trade stocks on Interactive Brokers while connecting via Devexperts to Nasdaq Totalview full market depth data. Access to crucial price information by comparing the current and historical liquidity in the market. This became available with the support of historical market depth data for any instrument subscription. Devexperts launched a unique dxFeed orderbook charting service for Bookmap, specially designed to minimize bandwidth requirements for heavy FOD data delivery used for visualization. Enhanced trading opportunities in multiple security types. Added connectivity and trading to the GDAX exchange, enabling the trade of Digital Currencies such as Bitcoin and Etherium. Mr. Galanos’ comments echo the trend in recent years where more professional traders demand precise high quality data visualization. The combination of Devexperts’ data with Bookmap’s visualization meet the demand of these traders and offer them competitive trading advantages.